I’ve been playing in a Savage Worlds/Realms of Chthulhu campaign (nominally) every other Thursday for the last year and a half. Or rather, I should say, I WAS. The campaign – the classic Masks of Nyarlathotep campaign – wrapped up at the end of spring. 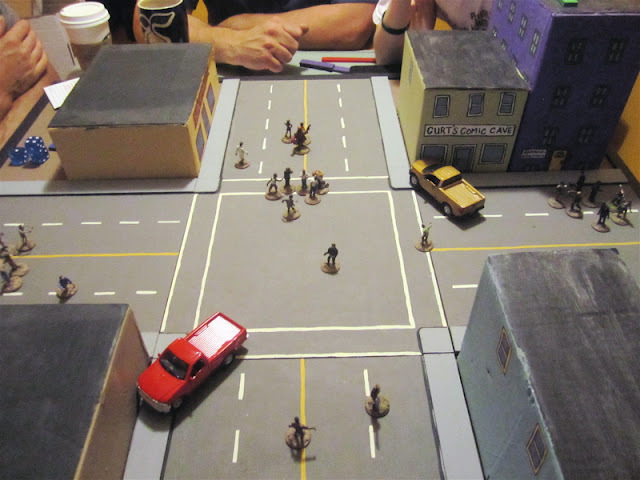 We thought we’d take a break from role-playing over the summer and I suggested I’d run some miniature games. 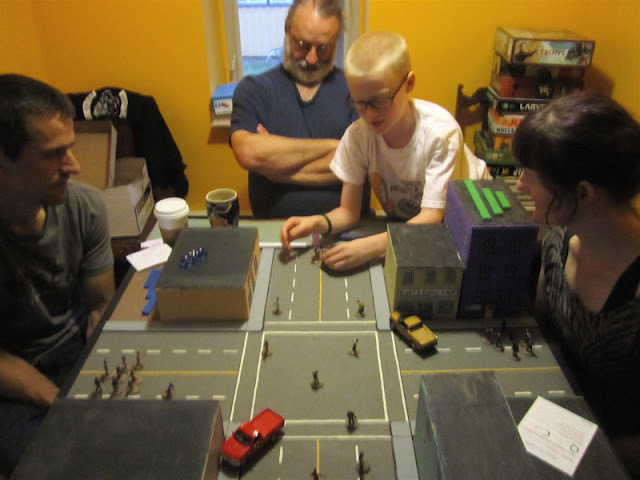 We’ve missed a few Fridays since the campaign ended, but we did get in a game of Frostgrave in June sometime (which I never got to writing a report about) and this past Friday I ran a game of Fear and Faith/Kooky Teenage Monster Hunters game. I gave the players the Scooby Gang and Hellboy and said they somehow met up in a town over run with zombies (because… these things… they happen…). 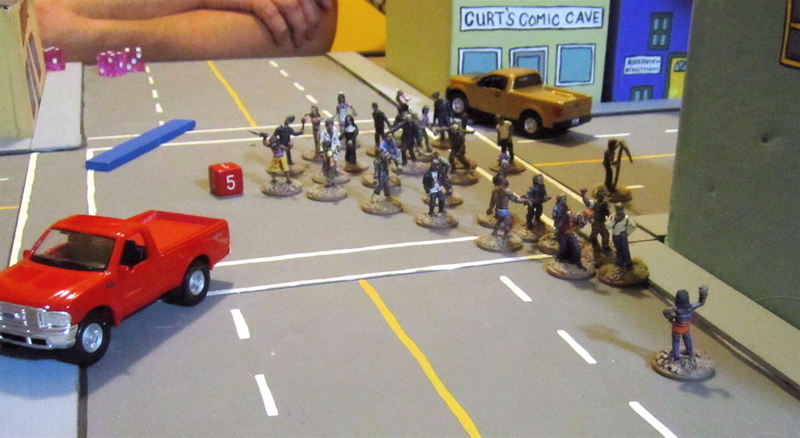 And they had to get off the opposite edge of the table (where the Mystery Machine was parked) so they could get out of town safely. The Boy, who hasn’t’ been playing in the Friday evening games, joined us for this evening. 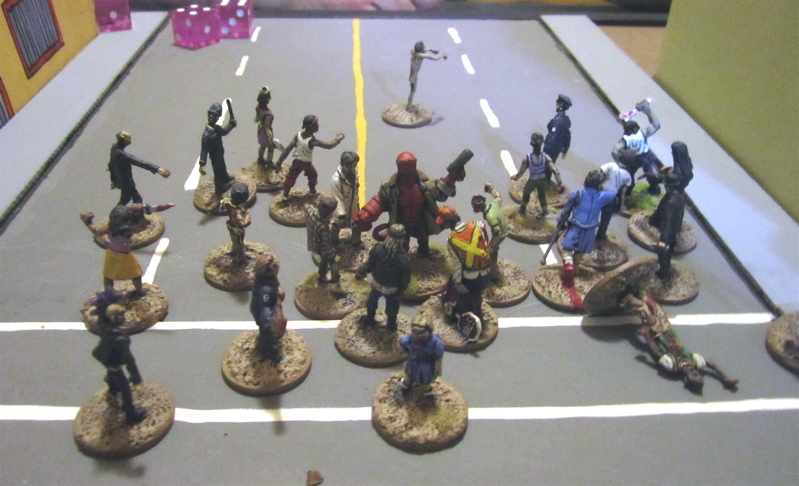 The rest moved up a but – with some zombies getting reactions and moving into contact with them. The zombies in Fear and Faith are MUCH more active than in Song of Blades and Heroes!! I think it SoBH they have a Quality of 5 or 6, in Fear and Faith they have Q4+ - now there were a LOT of them so the individual ones I didn’t want to cause any turn-overs, so I usually only used one activation die, but with the largetr groups that I moved as mobs I would roll two – or three if they were the last to go – and then really moved – even WITH a short move! Fred and Shaggy encounter some zombies as they arrive at the intersection. 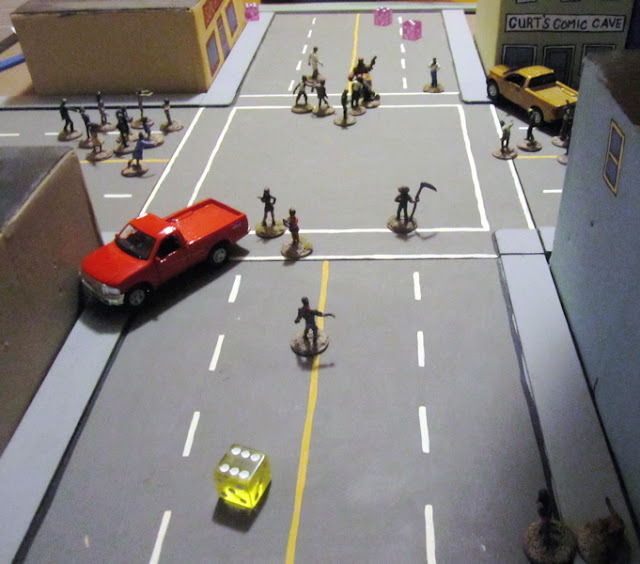 Daphne and Velma raced past Fred and Shaggy and straight through the intersection. Two Zombies shambled up to Velma, but Daphne managed to give them the slip! Once the Mob got going things started really going down hill. Shaggy got eaten. 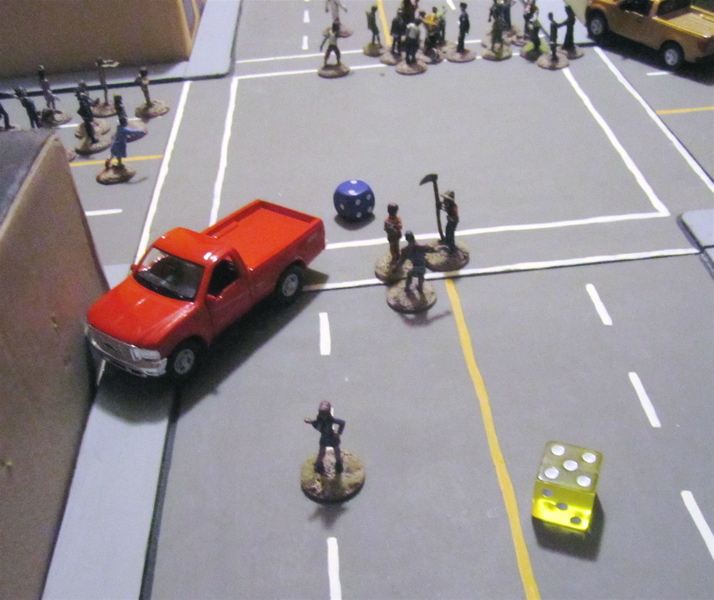 On one turn Hellboy had three action. He used two to do a Power Blow with the Right Hand of Doom (classed as a Heavy Melee Weapon) and crush a zombie… but fell down. We said he slipped on Shaggy’s guts (who had been right nest to him) luckily with the remaining action, he got right back up. 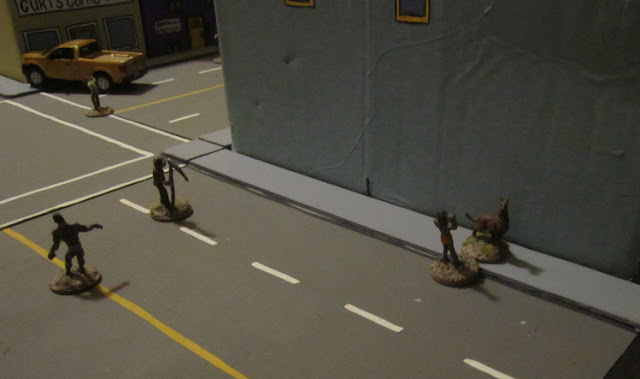 Sadly the two zombies that attacked Velma over powered her and ate her brains. They were probably delicious…. Daphne was, like, totally sad… but she continued on her way. Someone had to escape! Back to the Great War Canadians – hopefully! I have to do some cleaning in the basement as I’m hoping I’ll be able to get a bunch of work done on the Terrain next week while the kids are out for the day all week at a Kayaking “camp”. Excellent!!! Loved the idea of Hellboy and Scooby & Gang fighting Z's! Thanks Ray! I've been wanting to play out that little team up for a while... I have a soft spot for knock offs of characters from popular culture (although in Hellboy's case, that figure is an officially licensed product!). So I have lots of team up options, but somehow Scooby doo and Hellboy seemed funnest (or funniest)! 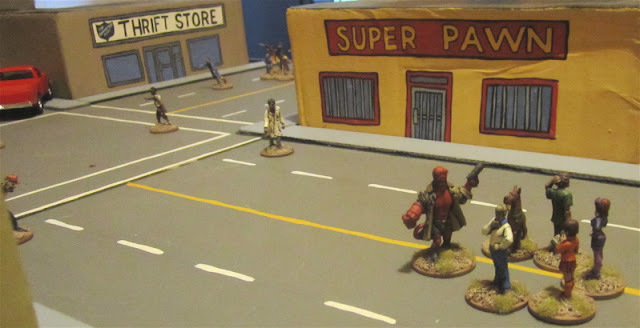 Tim, this is off topic of your post, but do you have a post where you explain your process to painting minis? It seems a lot different from the style I'm used to growing up in 40K and is like to try your approach. Thanks! I basically undercoat everything in black and then block paint areas leaving a bit of black in the recesses for shading... with flesh and lighter colours - or on special features (like a big flowing cape) - I do a base coat of a darker shade of a colour and then highlight with a lighter shade. It won't win any painting competitions, but it gets stuff done fast and looks good enough on the tabletop.